CFN - CALIFORNIA FIRE NEWS - CAL FIRE NEWS : #NWS FIRE WEATHER WATCH - MONO EASTERN ALPINE COUNTIES BELOW 7000 FEET. #NWS FIRE WEATHER WATCH - MONO EASTERN ALPINE COUNTIES BELOW 7000 FEET. THE NATIONAL WEATHER SERVICE IN RENO HAS ISSUED A FIRE WEATHER WATCH BELOW 7000 FEET...WHICH IS IN EFFECT FROM TUESDAY MORNING THROUGH TUESDAY EVENING. AFFECTED AREA: IN CALIFORNIA...FIRE ZONE 273 MONO AND EASTERN ALPINE COUNTIES BELOW 7000 FEET. WIND: SOUTHWEST WINDS MAY INCREASE TO 20 TO 30 MPH WITH GUSTS 45 MPH AHEAD OF A COLD FRONT TUESDAY AFTERNOON. WIND PRONE LOCATIONS COULD HAVE GUSTS TO 60 MPH AT TIMES. HUMIDITY: MINIMUM HUMIDITY MAY FLUCTUATE BETWEEN 15 AND 25 PERCENT THROUGH THE AFTERNOON AND INTO THE EVENING. IMPACTS: THE COMBINATION OF GUSTY WINDS AND LOW HUMIDITY WILL CREATE CRITICAL FIRE WEATHER CONDITIONS. PRECAUTIONARY/PREPAREDNESS ACTIONS. 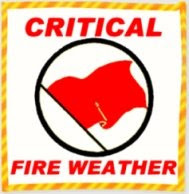 A FIRE WEATHER WATCH MEANS THAT CRITICAL FIRE WEATHER CONDITIONS ARE POSSIBLE. CHECK WEATHER.GOV/RENO FOR UPDATES AND POSSIBLE RED FLAG WARNINGS.